Place your bets and win a very special watch! Fine watchmaker Christophe Claret is pleased to announce its partnership with the Casino de Monte-Carlo. This cooperative effort between the master watchmaker of Le Locle, Switzerland and the legendary casino in Monaco will be marked by a glittering celebration on December 9th and 10th 2011. A major roulette tournament event is being arranged by the famous gaming house, long a landmark as famous for its history and clientele – past and present –as for its Belle Epoque architecture. 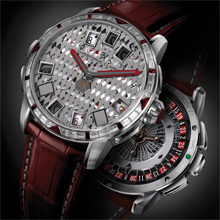 The lucky winner at the roulette table will become the proud owner of a 21 Blackjack watch by Christophe Claret. This unique piece is set with baguette diamonds and rubies and stamped with the logo of the Casino de Monte-Carlo. Every aspect of this timepiece embodies the maker’s expertise in fine watchmaking. It is an honour for Christophe Claret to be represented in this historic venue. In fact, this is the first time that the Casino de Monte-Carlo has decided to offer a watch for the tournament. This mark of trust shows just how exceptional the 21 Blackjack really is in the realm of games of chance, as re-envisioned by fine watchmaking. In roulette, Lady Luck either smiles on the player, or not. In watchmaking the opposite is true: during the design, development and construction of a watch, nothing is left to chance. Everything is calculated, modelled on a computer, then checked and approved by the THF(acceptance testing) department. Tolerances are expressed in microns. Such are the exacting standards of Christophe Claret, which in twenty years has become one of the leading Swiss designers of highly complicated mechanical movements. The company develops calibres for about twenty of the sector’s most prestigious names. It is also its own brand that creates highly complicated watches under the Christophe Claret name, in an ultramodern facility with the latest advanced equipment and about a hundred highly qualified employees. In this context, the 21 Blackjack watch is a truly fitting example of the creative, exclusive, playful and unconventional timepieces dreamed up in the Le Locle workshops. It can be summed up in a few words by noting that its precious white gold and titanium case houses a true miniature casino. 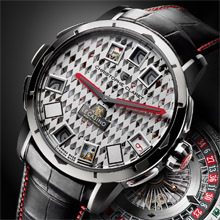 To the traditional functions (hours and minutes), this amazing timepiece adds some very original complications: blackjack, roulette and dice, all with sensory effects. For example the two dice, which measure 1.5 mm on a side, are housed in a cage at o’clock that is visible through a small window in the case middle. The roulette game is on the back of the watch. The winding rotor, which can be seen through a glareproofed sapphire crystal, serves as the roulette wheel. As for the blackjack cards, they appear as if by magic on the dial. The player’s cards are displayed on the lower part of the face in four tiny rhodium-plated windows, while the bank’s cards are on the top. The game is started by pressing a pushpiece at 9 o’clock. The button arms a spring that simultaneously turns all seven of the gold discs on which the cards are transferred. After a few moments, the discs are stopped by catches, randomly but very accurately so that the cards are lined up with the windows. And best of all, a chime rings each time a player’s or banker’s card is revealed. The chime mechanism is also visible through an opening at 2 o’clock. The 21 Blackjack watch that the lucky roulette tournament winner will take home is a technical and aesthetic masterpiece all wrapped up in a single package, a small tour de force of mechanical watchmaking at the forefront of innovation. It is an exceptional piece for anexceptional event, to equal the prestige of the famous Casino de Monte-Carlo. 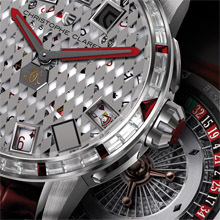 In connection with this tournament, Christophe Claret will be introducing another version of the 21 Blackjack, very similar to the unique prize watch because other than the precious stones, it includes the same technical features. It is also stamped with the Casino de Monte-Carlo logo. Boasting an extraordinary self-winding movement, 501 components and exceptional finishes, it too belongs to the highly exclusive circle of fine timepieces. The first pieces in this limited series of 21 will be available in December 2012. Finally, the exhibit of Christophe Claret watches will be open to the public on Saturday, December 10th 20111, from 5:30 to 6:15 p.m. at the Hôtel de Paris near the Casino de Monte-Carlo. ceramic double ball bearings, 28,800 vibrations per hour, 4 Hz, power reserve approx.